By Sam Smith | 6.2.2016 | 9:40 a.m.
Margot Kerr is as happily bewildered, at times, as husband Steve about all this. All this being Steve’s Golden State Warriors Thursday opening defense of their NBA title against the Cleveland Cavaliers as Steve goes for his seventh championship as a player and coach. Seven rings! Watch out, Phil, he’s coming. It’s a promised NBA Finals, a rematch with Kerr’s record breaking Warriors featuring Stephen Curry, Klay Thompson and perhaps the next evolution of basketball against LeBron James and his own stable of stars with Kyrie Irving and Kevin Love. It has the makings of a dramatic and climactic tale, though no more curious than the one continuing to be told around the travels of the Kerr clan. The amazing journey of the Kerr family continues, and you wouldn’t really make it up because it’s, as the saying goes, too unrealistic. It has so many unbelievable (that being sports’ most overused cliché, except it applies this time) chapters. There was Steve fortunate even to get a basketball scholarship to the U. of Arizona after offered none following high school, a 1988 second round pick of the Phoenix Suns hidden on the injured list as what seemed more a marketing tool with the Suns enduring a drug scandal. 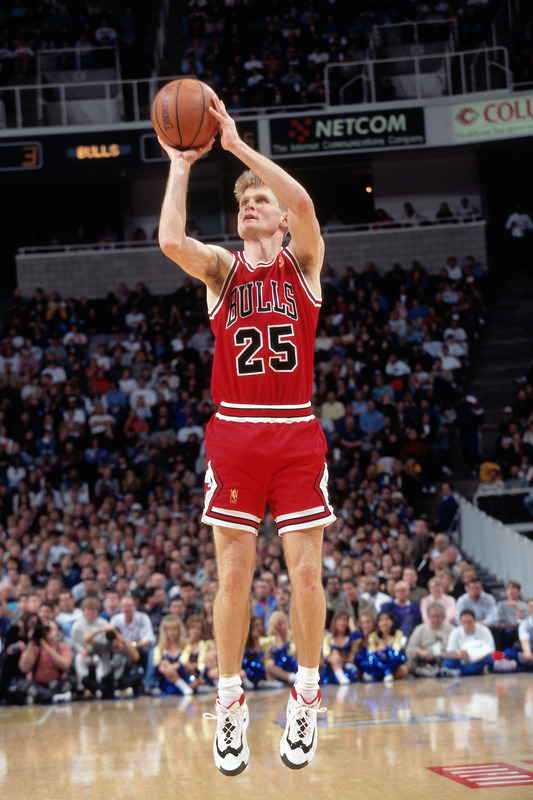 Then traded to Cleveland and then Orlando, where he couldn’t beat out guys like Litterial Green and John Battle, and after the 1992-93 season when he rarely played and basically out of the NBA after five years—though really five more than Kerr or his coaches ever figured he’d get--Kerr essentially applied to the Bulls for a tryout. This is not generally how things are done in the NBA. But life is about luck and timing and also taking advantage of your opportunities. And then being able to do something with it. Steve Kerr certainly proved he could. Steve, baby faced with a welcoming personality, often has been described like a Huck Finn or Opie Taylor character, though a fiery competitiveness belies those quiescent comparisons. Margot, a Tucson native, met Steve at college. She’s got some of Harry Potter’s Hermione Granger in her, bright and positive and ready for adventure. “I thought, sure, what the hell,” Margot recalled about the leap to Chicago. They had this infant, and nowhere really to stay, and never really had been to Chicago, and there was hardly a guarantee. In fact, there wasn’t. Steve signed a one-year non-guaranteed minimum contract for what essentially was a Bulls tryout camp in the fall of 1993. Bulls general manager Jerry Krause put it this way back then: "He's a kid who can shoot the ball, play point and off guard. He has a chance (to make the team). We have a non-guaranteed spot. Steve wanted a shot. We'll see what (Trent) Tucker's health situation is and Corey's (Williams) improvement, a lot of things. It will spark some competition in training camp." Yes, Steve was the only one quietly applauding when Jordan retired for the first time in 1993. “Then he had a good training camp,” said Margot. “We were living at that Residence Inn right next to the Berto Center; all three of us in one room, a little baby nine or 10 months old. It was interesting. But we were so worried. We had to every week tell the front desk if we were going to be there another week, something like that. We know the story from there. Jordan returns to the NBA. He does take time out to beat up Kerr one day in practice, though two years later at the end of Game 6 in the 1997 Finals, it was Jordan looking for Kerr in another sense. Jackson had drawn up a (hopeful) game winning play for Jordan, who anticipated a Utah double team with John Stockton coming off Kerr. So Jordan in the frenzied huddle tells Kerr to be ready, that he was going to pass him the ball, and when Michael says that you better be ready. A career of shots, though, more importantly, a lifetime of challenging obstacles and doubts, and Steve was ready. His 17-footer was the game winner before the Bulls knocked away the subsequent inbounds pass from the Jazz. The following season made it three championships with the Bulls, though no starts. Then it was a fourth consecutive championship as Kerr signed with the San Antonio Spurs for the 1998-999 season with the biggest contract of his playing career, five years and $11 million, and a reputation as if not the most prolific, the most accurate three-point shooter in NBA history. Kerr had a detour to the Portland Trailblazers in 2001-02 and then back for a final season with the Spurs as he proved vital again with a three-point shooting display to bail out the Spurs in the clinching Game 6 of the 2003 Western Conference finals. The Spurs went on to title No. 2 while Kerr made it ring No. 5. Then after a conference finals appearance as an executive with the Suns and analyst work on games for TNT, Kerr was about to repay a debt to Jackson for that playing chance in 1993 and coach the Knicks for Jackson as team president. Jackson had long told associates if he ever were to run a team, Kerr would be his coaching hire. Of course, Steve also thought Orlando was and took a $20,000 pay cut in 1992-93 to accommodate a trade to the Magic because he figured to be a perimeter fit with Shaquille O’Neal. It didn’t happen. “He felt on paper they had the big guys in Orlando and they wanted shooters all around, but he barely played,” said Margot. “We never really thought he really was going to play in the NBA. Phoenix gave him a shot probably because they had a lot of issues with the drug stuff and they probably thought he was a U. of A. guy, local, clean cut and it will be good for business (to sell tickets in Tucson, also), basically such a great franchise and management, and it was tarnished a little. And then he really didn’t play, but what a wonderful organization with the Suns. “So Cotton trades him to Cleveland where Gary (Fitzsimmons, Cotton’s son) was and Lenny was great, but he knew he really wasn’t going to play much,” said Margot. “But with Lenny and Wayne Embry, it was such a professional organization, high class, great ownership; you learn seeing that. Then the Orlando thing and I don’t think he had any other offers. I’m pretty sure he was a free agent with really nowhere to go and probably basically begged his way onto the Bulls. And wonderful, and if no one quite deserves all that good fortune, no one also begrudges it to a couple and a family who just enjoy the ride like appreciative tourists. And who never forget that time in Chicago, where it all changed.